easy to make, even for beginners and quick enough that it could be enjoyed on a weeknight for dinner. Enjoy Naan with any curry of your choice. Add the active dry yeast and sugar to the warm water and stir till the yeast is dissolved. Allow yeast to soften and stir until yeast is dissolved. Cover measuring cup with towel and allow yeast and water to froth for 5-10 minutes. In a large mixing bowl, combine flour and salt. Add yeast water, yogurt, and ghee and begin to knead for 5-10 minutes until a dough forms. Punch down dough, and knead in garlic. Place dough in bowl coated with oil and turn dough around to evenly coat. Cover bowl with towel and allow to rise in a warm area for about 1 hour or until the dough has doubled. Preheat your oven to 200 C/ 400°F for 2 to 3 minutes. Equally divide dough and roll between your palm into 10-12 round ball. Lightly flour the same surface on which you kneaded the dough and roll oval shape out of dough. Place rolled out dough on greased cookie sheet or baking stone and brush with melted butter. 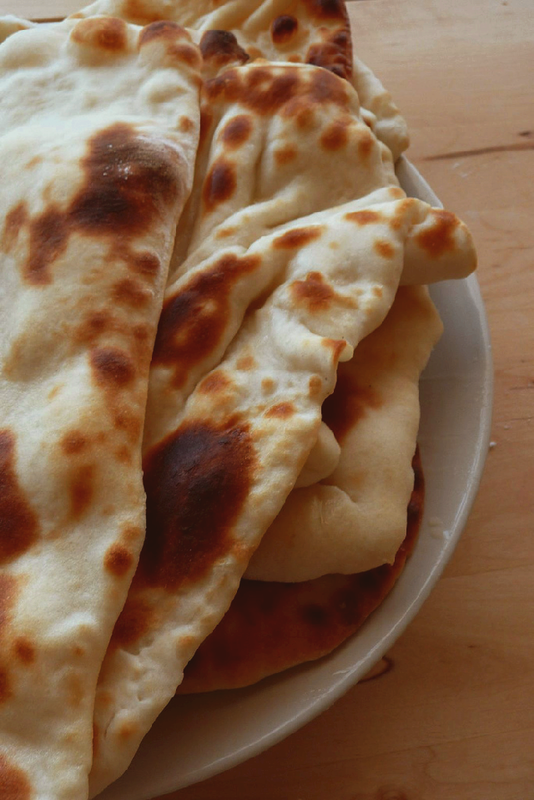 Serve naan hot in a foil-lined basket immediately or store in pantry or freezer.